LITTLE-KNOWN property developer Seni Nadi Land Sdn Bhd (SeniLand) will undertake a project with an estimated gross development value (GDV) of RM2 billion on two parcels of land in Brickfields, Kuala Lumpur, where the former Brickfields district police headquarters and barracks were located. SeniLand, through Senibina Sentral Sdn Bhd, plans to build two Grade A, green-certified office buildings on the 107,865 sq ft site, located between the La Salle Brickfields primary school in Jalan Tun Sambanthan and the Klang River. While the building plans for the police barracks parcel at the corner of Jalan Tun Sambanthan 2 and Jalan Thamby Abdullah 1 — across the road from the former police station — have yet to be finalised, it is understood that SeniLand, through Seni Murni Sdn Bhd, is likely to build high-end residences there. This parcel measures 101,669 sq ft.
An online entry describes SeniLand as a diversified real estate group focusing on real estate development and asset management. It is principally engaged in the ownership, development, management and acquisition of commercial residential real estate and land in the Asean region. A search with the Companies Commission of Malaysia reveals that SeniLand is 70%-owned by Projek Bizbumi Sdn Bhd and 30%-owned by one Chua Hian Chung. Projek Bizbumi, meanwhile, is owned by Datuk Noorashikin Abdul Rahim (40%) and Lukman Mahmood (60%). SeniLand owns all but two shares of Senibina. The two shares are held by Mohd Faizal Zainal and Wan Rosima Andak Wan Mohamed. Similarly, SeniLand owns all but two shares of Seni Murni, which are held by Wan Noor Mohd Yusoff W Musttafa and Mohd Faizal Zainal. According to a source, SeniLand is connected to another company called Panglima Capital (M) Sdn Bhd, which in turn is wholly owned by Padu Panglima Sdn Bhd. The latter is owned equally by Gen (Rtd) Tan Sri Mohd Ghazali Mohd Seth, Asiapacific Capital Management Sdn Bhd, Lt-Gen (Rtd) Datuk Seri Zaini Mohd Said, Major-Gen (Rtd) Datuk Abas Mohd Yunus and Syahriza Mokhtar. The two Brickfields parcels formed part of a land swap between the government and Primamuda Holdings Sdn Bhd for a new police headquarters building next to the Jalan Travers police station. On Dec 21, 2012, the Federal Lands Commissioner, as the owner of the district police headquarters land, transferred the property to Syarikat Tanah dan Harta Sdn Bhd (STHSB). STHSB’s shareholders are The Federal Lands Commissioner (Incorporated) (holding one share) and the Minister of Finance (the remaining 60,001 shares). STHSB, which functions to facilitate the development of government land, transferred the land on the same day to Primamuda Holdings. In April last year, the land was sold to Senibina. The shareholders of Primamuda are Tan Sri Mohd Ramli Kushairi (30%), Datuk Ahmad Khairummuzammil Mohd Yusoff (20%), Datuk Dr Dzulkarnain Shafiee (20%), Mariany Mohamad Yit (20%), Azlan Azizuddin (5%) and Mohammed Azman Md Yusoff (5%). Documents sighted by The Edge state that the transaction between the Federal Lands Commissioner and Primamuda was executed at RM52.1 million. It is, however, unclear if this amount is in addition to the fee for the construction of the new police station. A year ago, Primamuda sold the land to Senibina Sentral for more than double the purchase price, at RM110.02 million or RM1,020 psf. It is learnt that the police barracks land was acquired for much less by Seni Murni as it is designated as “residential”. 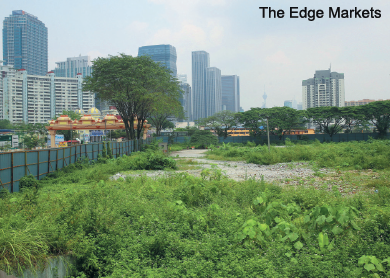 The Edge understands that Primamuda had initially submitted a development order to build residential towers on this parcel but has since disposed of the land to Seni Murni. This parcel is likely to retain its residential status with SeniLand building high-end residences. But this project is expected to start much later. Meanwhile, Senibina’s submission to Dewan Bandaraya Kuala Lumpur (DBKL) indicates that the first phase will be a 31-storey office block and the second phase, a 24-storey office block atop a seven-storey podium, comprising parking bays and one floor of retail space. There will also be two levels of basement parking. DBKL gave a conditional approval for the project on March 19. The project, with a GDV of more than RM1 billion, is expected to begin in the third quarter of 2015. Sources say the owners plan to obtain MSC Malaysia status for this development and have yet to decide whether to sell the office space or keep it for recurring income. Several other developments have been planned in and around Brickfields, including Rivo City by Bina Puri Holdings Bhd and Prasarana Malaysia Bhd, small offices/versatile offices and serviced apartments. 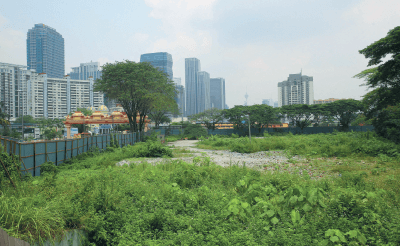 Malaysian Resources Corp Bhd plans to redevelop Lot 349, also known as 100 Quarters, in Jalan Rozario and Jalan Chan Ah Tong. The area was formerly the quarters of Malayan Railway staff. Three blocks of serviced apartments are expected to be developed here. Five 24-storey blocks, comprising 1,208 PR1MA units, will be built on 3.6ha of government reserve land in Jalan Thamby Abdullah 1.